I’ve got a standard showering time down to three minutes. Still, apparently, it’s not short enough. The whole family gravitate to the en-suite whenever I turn on the taps. By minute two someone (usually Ken) is laid out at the bottom of the shower door screaming my name. A couple of weeks ago these single minutes I plead for were all counted up into one big stretch of time and I headed off to London with a pal. It was marvellous. We got off the train at Euston, headed up to the champagne bar at St Pancras, swooned over the beauty of product in Liberty, shopped in flagship stores, watched the Rolling Stones in the heat of Hyde Park, stayed in Covent Garden and visited the Bowie exhibition at the V&A. Now this blogpost isn’t to sell the concept of London to you. We all know it’s there and it’s an amazing city. It’s taken six years to return since my last visit but booking a train and heading south is easy enough to organise. My big concern on the run up to the weekend was what to wear. Superficial, I know. I am happy with work attire; it sits there in the wardrobe waiting to be grabbed in the morning pre-office preparations. Out for nights grab something black, right? And I think I managed it in the end. The simple formula (I imagine has been much discussed in ‘capsule wardrobe’ articles I have skimmed over for years) was this…cool linen dress (a little bit vintage – Tara Starlet 40s daytime frock –the ‘home front dancing dress’ is the current nearest), a pair of Clarks Originals flat sandals, a cross body bag and a backpack. The sandals are imaginatively called ‘Kestral Soar’. In 1985 my Granny Alice bought me a pair from a shop in Leigh and made me wear them. On the bus back to her house I cried all the way. They were definitely called Jesus Sandals back then. Funny how things change. I recently, willingly paid good money for them and, wow, are they comfortable. I know that I am no style guru and not in a position to preach to anyone about what to wear, it’s just a bit of simple information. A modest backpack was big enough to fit in all I needed for the weekend. The guaranteed dry weather forecast helped – it made it easy to pack lightly. So if you find yourself shouting for a minute remember to keep a tally. It might turn out they quickly build into hours and then even a couple of days. Then it’s a dress, flat sandals, cash and you’re away. 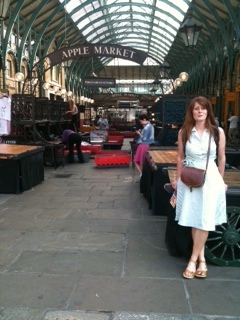 I returned feeling post-London tired and had left my voice in the big smoke but I also felt revitalised. And the best thing about getting back was seeing Ken, Finn and Tilly at the station and feeling ready to give them all of my time again (until my next break-out). I do love them – not tried them with socks (er, don’t think I have the pins if it was a sartorial choice with a dress…although might work with socks under jeans? )That could be the answer to my Autumn/Winter shoe concerns. Since my brogues gave out I have not known what to wear in their place.